Application Rate: Apply 1 scoop (1 oz) for every 25 sq ft directly to the affected area once a week. 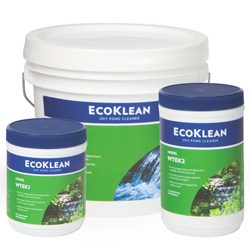 If problems persist apply EcoKlean twice a week at the prescribed rate until desired results are achieved. For Best Results: Remove excess debris by hand or brush before initial application. With pump turned off, apply EcoKlean directly to area to be cleaned. Wait 10-15 minutes before turning the pump back on.